◆ This flashlight adopte COB technique making multi LED chips packaged together as one module to have the advantage of thermal resistance, larger cooling area, and higher lighting efficiency. 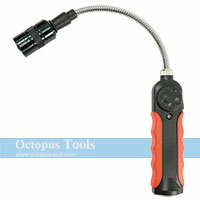 ◆ With micro adjustment lumen switch, thie flashlight can be adjusted incrementally. 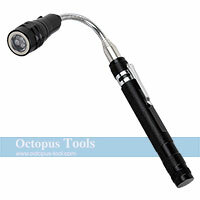 ◆ With powerful magnet in the base, the flashlight can be fixed on the metal and provide a hand-free user experience. ◆ 180° swivel hanging hook makes it more easy to store and carry. ◆ Build in 2350mAh Li-ion battery. With 5V 1A USB charger and USB cable. 1. 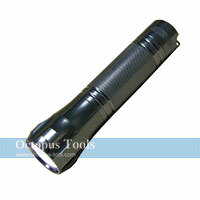 The flashlight works approximately 2.5 hours when full light is on and 12 hours when semi light is on. ◆ Red light on means flashlight is in charging. ◆ Blue light on means charging is completed. ◆ Yellow light on means low battery. ◆ With magnet in double heads, you can easily reach small metal parts. ◆ Convenient pocket-clip enables you carry it wherever you go. 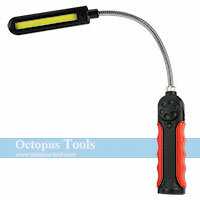 ◆ Bendable shaft helps increase visibility in every angle. ◆ Magnets on both sides help reach small metal parts and can be attached onto metal surfaces. ◆ Lumileds bulb from U.S.A.
◆ With strong magnet base and flexible torch head, it's the perfect tool for car repairing and can also be used as a pick-up tool in dark and narrow space. ◆ 5W bright Cree LED. ◆ Adjustable focus suits different environment. 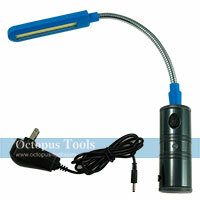 ◆ This work light is charged by standard USB cable (included). 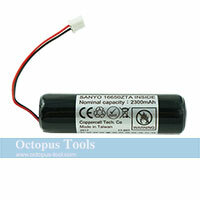 ◆ Powered by rechargeable Li-ion battery. ◆ One adapter and one USB cable are included. ◆ Tool for home, machine and automotive repairing. 1. To turn right and left for on and off, or you can turn the switch slightly in two different directions for preferable light. 2. With built-in 2300 mAh Li-ion battery for recharging power supply. 3. Connect USB cord to the USB charging port and plug into socket for re-charging. 4. LED charging indicator, red light on means in the middel of charging while blue light on means charge is completed. 1. Do not turn on the lumen switch when charging battery. 2. Always unplug after battery completely charged. 3. Do not disassemble the built-in battery. 4. 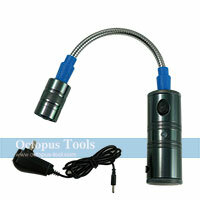 Keep the LED light away from fire / water or heat / damp place. 5. Do not immerse the LED light in water / solvent. 6. 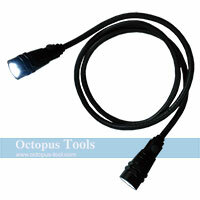 To avoid harming eyes, do not look the LED light directly. 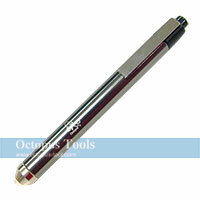 ◆ With strong magnet base and flexible shaft, it's the perfect tool for repairing in dark areas. ◆ With 8W 30 chip COB LED. 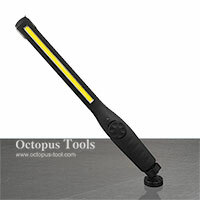 ◆ With magnet and flexible torch head, it's the perfect tool for car repairing and can also be used as a pick-up tool in dark and narrow space.